Without any mention at the Android-verse, quietly and unnoticed, something interesting has appeared on the Android marketplace. 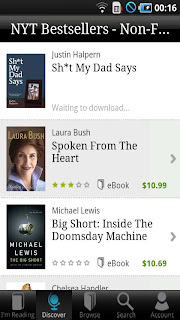 The first and, up to this day, only ereader-software for Android capable to handle ePub-DRM files. Yes, finally. And even more interesting, this company also offers a new ereader, the Kobo-ereader. And that's the name of the app, too. Kobo is the company that produces the slick and very simplistic low-price reader, recently mentioned in the news. Basically, you buy your books on their own bookstore, kobobooks.com, and it appears right away if you start the app and login with your credentials. No need to sync via computer or anything. After the book has transfered, you can read it on your Android phone. 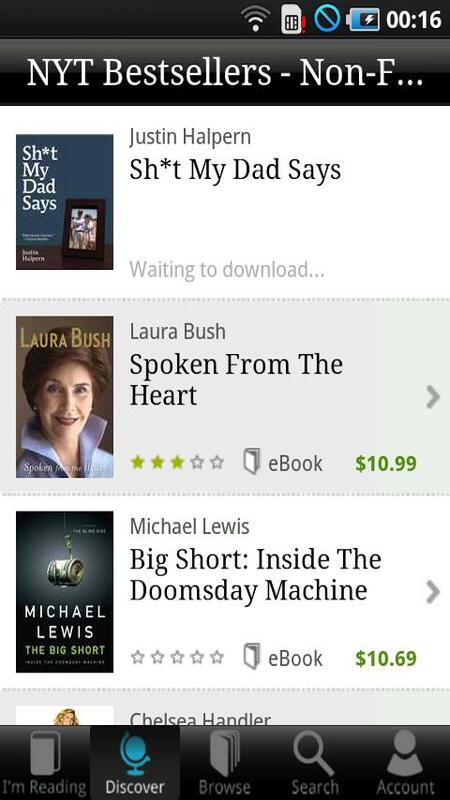 The books can be read on different devices, not only your phone or your eBook reader from Kobo. Almost any ePub-DRM reader can be used, like the Sony-readers. If you take a closer look, you find the app very, very minimalistic, and you might see that it's just arrived at the market. On the other side, it worked on my G1 instantly, without anything to transfer or care about the DRM, no special software needed, nothing. Buy, start the app, wait for the transfer being finished the first time, read. The App stores the books on the SDcard, so you have plenty of room if you have a big card. It's a bit slow and there are virtually no options expect setting font-size, font and switch to night-mode. The software needs some improvement, that's for sure. The biggest caveat is the non-existing import function. You can't just copy ePubs or other files on the card and get it in the reader, no matter if with or without DRM. So it's a Kobo-only solution at this time. I hope that you can import other books into the reader in the future. It's a nice experience, it just took me about 35 seconds from the buy to reading the first line on my phone. For sure there is a lot of work for Kobo to do on that software ereader. For now, it's the only way to get big publications and mainstream books on the Android. Photo Copyright © 2010 by Kobo. All rights reserved.